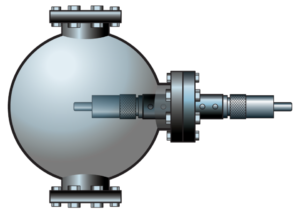 VFT Vacuum Feed Through channels light into or out of a vacuum chamber for a variety of ultra-high vacuum applications. The VFT’s high- and low-pressure sides are terminated to an SMA 905 Connector and couples easily to optical fibers and IDIL’s light sources, miniature fiber optic spectrometers and accessories. 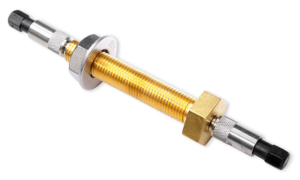 The VFT can be screwed into a 3/8-24 external threaded hole in the vacuum chamber, or can be bolted into a smooth hole with the provided nut and washer. Setting up is as simple as attaching an optical fiber to the VFT using a 21-02 Splice Bushing. Optional aluminum-jacketed or armored-cable optical fiber assemblies are recommended for the low-pressure side of the chamber. Vacuum Feed Throughs are available in optical fiber diameters of 200 µm , 400 µm , 600 µm and 1000 µm diameters. Each VFT includes two 21-02 SMA Splice Bushings – an inline adapter that mates SMA 905 Connectors. VFT are available in four standard flange types: KF40 and KF16 ISO Flanges and 2.75″ and 1.33″ Con-flat Flanges. Vacuum feedthrough allow you to create a fiber route into a vacuum chamber. Consisting of a segment of optical fiber mounted within a bolt or flange, they can be mated to other optical fibers using splice bushing. Glass to metal buffer sealed (best): uses a glass-ceramic compression sealing technique to make the seal between the fiber and the metal. Rated to 350°C and good for ultra-high vacuum applications.